After a brief hiatus in the App Store, Sega last month released Sonic the Hedgehog [App Store], the Genesis / Mega Drive classic apparently wrapped in an emulator, for the iPhone and iPod touch. 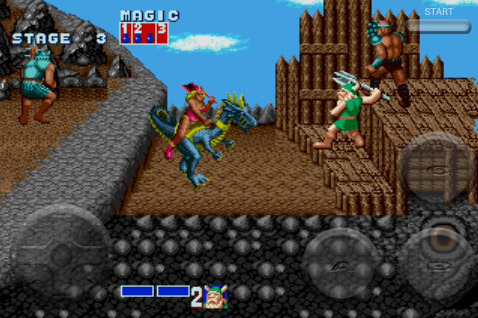 This morning the studio followed Sonic up with another emulated classic for the iPhone, the Genesis / Mega Drive version of the 1989 arcade classic Golden Axe. Three mighty heroes, a powerful Fighter, a female Amazon, and a mighty Dwarf have a score to settle with the evil Death Adder who has captured the King and his daughter, and holds them captive in their castle. Choose your hero in this classic action game, as you fight through Adder’s henchman as you battle through dark castles, on the back of a giant turtle, and even on the wings of an enchanted eagle with weapon & magic; and even ride the fearsome, fire-breathing beasts. Golden Axe for the iPhone features the original’s choice of three heroes to choose from: the battle axe-wielding dwarf, Gilius Thunderhead, the male barbarian, Ax Battler, wielding a two handed broadsword, and the long-sword-wielding amazon female, Tyris Flare. All of the heroes have magic, as well as steel, at their disposal in their fight against the levels’ various enemies. The iPhone version of the game, like the Genesis version that it really is, features two additional levels not found in the arcade original. 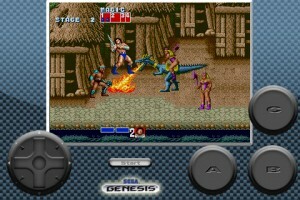 As with Sonic for the iPhone, Golden Axe offers virtual D-pad and buttons as the default control arrangement, with the option of accelerometer-based controls. As well, there are two display modes to choose from: a full-screen stretched arrangement with semi-translucent control icons and a framed, original size view (320 x 240 pixels) which runs at a slightly higher framerate. And how does it play? Well, it’s pretty much the Genesis experience (which is pretty much the arcade experience), but played with iPhone controls. The iPhone controls seem to hold up pretty well all things considered (see video). The accelerometer option is a nice addition in case you just hate virtual d-pads. Meanwhile, overall performance seems more consistent than it did for Sonic, and held up well in the early levels. For those who call the game an old favorite, the iPhone version is worth a look. Previous PostPrevious iPhone and iPod Touch Gaming Accessories… Coming Soon?